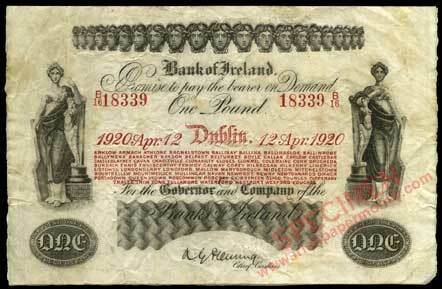 A survey is underway of Bank of Ireland £1 notes in an effort to determine the relative rarity of each Type, variety and signature variation. There are three signatures and four Types for these notes. Series F with branches: Baskin (1918–1919); Fleming (1920). Series G without branches: Fleming (1920); Hinton (1921). Image posts welcome, or send any scans by email for inclusion. The intention is to build up a picture of the surviving notes, and to create a date gallery of the notes in the main web site. PMI has recorded most of these notes by date, so we know they are out there. 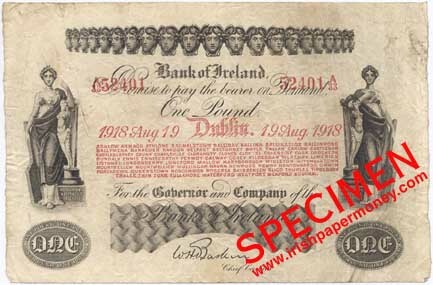 Bank of Ireland £1 1918 — Series F. Baskin signature. £1 1920. — Series F. Fleming signature. 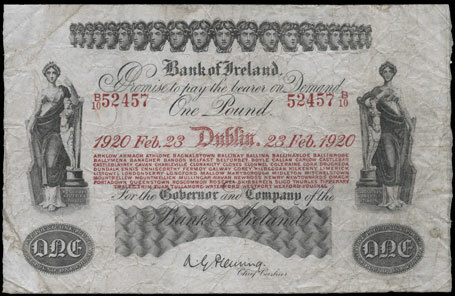 Bank of Ireland £1 1920 — Series G. Fleming signature. 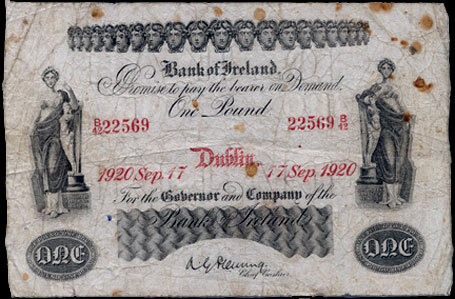 Bank of Ireland £1 1921 — Series G. Hinton signature. Some progress made here. Thanks for all the notes submitted so far. The count now stands at images of 27 different dates. The highest prefix is B60, on a note dated 18 Oct 1921. Did some scavenging and got the picture count up to 43 notes in the database. Thanks to Doc for some nice scans! If my maths is up to spec, there are 90 A prefix notes and 53 B prefix notes, 143 prefixes and dates in all. Someone should collect these by date! So, 30% of the dates are in the dataset already. Time to think up a name for the survey! Highest note recorded in this survey is the note below, B61. PMI has it up to B62. Added a few more notes to the survey, including a B62 prefix, below. Thanks doc for he pic. This is the highest prefix note recorded in the literature so far. 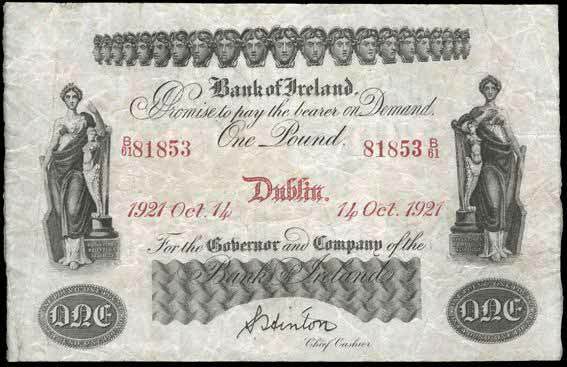 Bank of Ireland One Pound 15th Oct 1921. Hinton signature. A good few more notes have now been added, thanks to a web scavenge, and contributers sending pictures. The count now stands at 52 notes, covering 41 prefixes. Not bad at all. 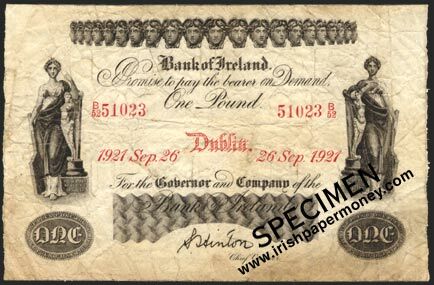 Most good collections of Irish notes of this period would seek to have an example of each of the four basic types pictured in the top post. Nice progress on the survey. I am curious to know if there are rules about the dates that the Bank of Ireland used. For example, Sundays appear to be excluded. Hey Mac. I have one of these in my collection. I will send a scan. Are they rare? Dealers over here never have them. These notes are not particularly rare. Auctions in Ireland and UK are the best place to obtain them. Survey update: the count now stands at 61 notes recorded, with 48 different prefixes/dates seen. Added another note over the holidays, making 62 notes, 48 prefixes. The picture gallery for these notes is coming along nicely, and will shortly be added to the web site. It will show at a glance which notes have been recorded, which ones we have pictures for, and which notes have not been recorded yet. The list of recorded notes in PMI is a start, and RSPS has some additional dates not listed in PMI. Additionally, some dates can be inferred from the known list of dates. It will probably be a long time before the date list is anywhere close to completion, but it has nearly been done for Consolidated Bank Notes, and we all love a challenge! Added two more £1 notes to this census in February, bringing the total to 63 notes, and 49 prefixes recorded. I finally added the section illustrating all the recorded Bank of Ireland reduced size (sometimes also called 'square') One Pound notes. The listing is missing pictures of some of the recorded dates. Hopefully these will be filled in over time. Finally added the picture gallery of Bank of Ireland One Pound notes by date. It took a bit longer to get it together than I expected. All the known dates are listed, along with an image of every date I have come across. Submissions of missing dates are welcome. I am working on similar galleries of the 1918–1928 notes of the other banks also—we're on a roll here! The picture gallery of these notes looks good, just been looking through it. A pity some of the scans arent great. Still, like with collecting you'll get improvers as it goes along. hopefully all the dates will turn up before too long. Added a previously unrecorded date: 12 April 1920, prefix B16. 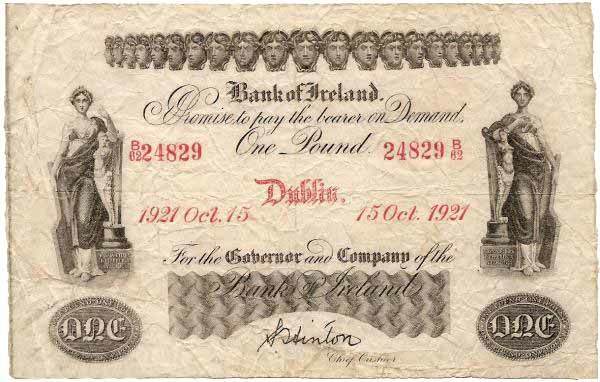 Bank of Ireland 1 Pound 12 April 1920, Fleming. Added a missing, known date: 10 June 1918, prefix A21. 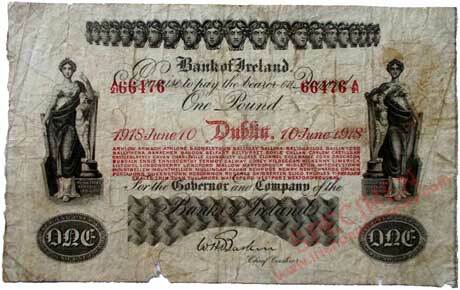 Bank of Ireland One Pound 10 June 1918, Baskin signature. Gaps are filling in slowly, it's gonna take a while to complete the dates.